brood jennies who have produced many foals, and not due to genetic factors. shaved close to the neck. 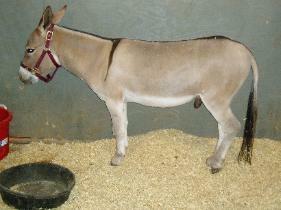 breeding Mules, as a good foot is much preferable to a large body on tiny stick legs and feet. seem to enjoy braying, and will "sound off" at any opportunity. 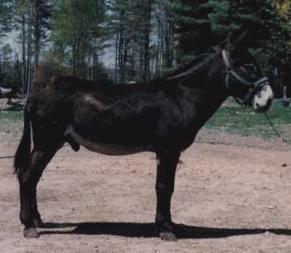 Although many donkeys are the familiar gray-dun color, there are many other coat shades. marks, as well as the "light points" - white muzzle and eye rings, and white belly and inner leg. 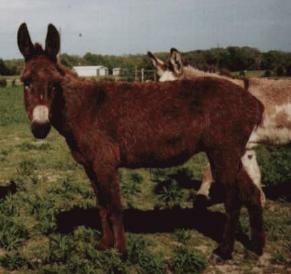 typical donkey markings may be passed on in part or whole to Mule or Hinny offspring. round spots resembling the appaloosa type. but galloping is usually not on the program unless dinner is being served. mix, although they can be trained to leave the house or farm dog alone! upright again! Beware overfeeding these hearty creatures! 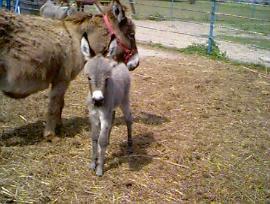 medicines, wormers and vaccinations are not effective in donkeys. help farriers with their first donkey trims. 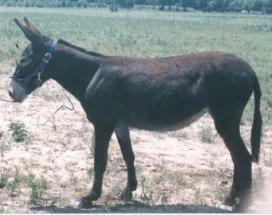 Donkey, Mammoth, Jackstock, standard, Mexican Burro - they are all terms for Donkeys. Where can I find a saddle that fits my donkey? 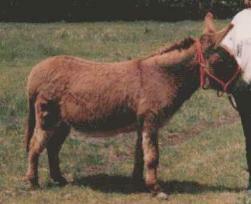 Donkeys vary individually as much as horses do. Under 36" at the withers. fat. See the bulge of fat on the neck. And no, HE is not going to have a baby! be in excess of 62", but they may tend to get too leggy and lose substance. Anything between 15-16 hands is usual. A VERY few have been over 17 hands. Texas that measured exactly 17 hands in February 2013. We are the authors, publishers and distributers. overseas shipping). Email us or use paypal now! lovelongears@hotmail.com and we'll email it to you! pages bi-monthly (6x yearly), Just $27 US, $37 for Canada, $50 for overseas members. Back issues from past years also available.